In the next few months South Africa will be changing its ordinary (or “free-to-air”) TV broadcasts to a new digital broadcast system. Decisions taken now will determine the future of television in South Africa. Please join Right2Know and Cape Town Community TV for a workshop on the future of TV in South Africa to mark Press Freedom Day 2015. RSVP: Space is limited confirm attendance at (021) 447 1000 email mark@r2k.org.za - or on Facebook here. 11h45: Two Breakaway Groups: Towards a Campaign on (1) contesting incentive channels and (2) public funding for CTV: What should we demand? How? Action plan? One of the advantages of digital TV is that it can carry far more channels. This is the good news as we could expect a greater diversity of views and information. The bad news is that ICASA (the regulator) want to give two thirds (66%) of the channels to the private sector. The SABC has been given a quarter of the channels (25%). The SABC does not have the resources to produce all these extra public interest channels and is likely to run them as profitable partnerships with the private sector. 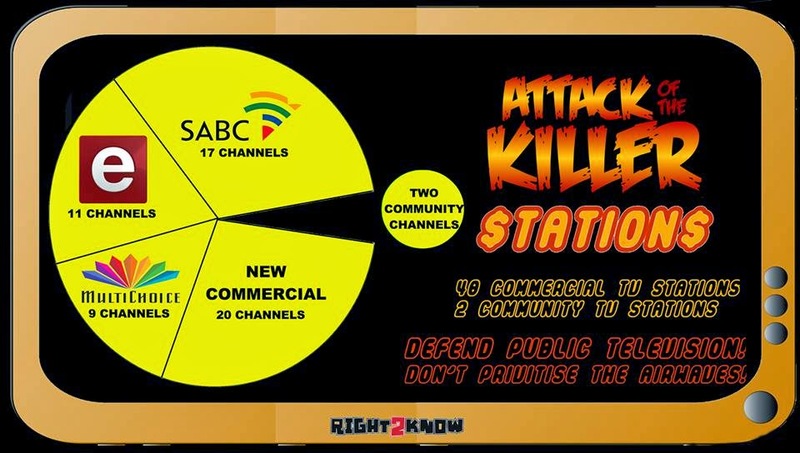 This dramatic privatization of the airwaves will see only 5% of stations being community non-profit; like Cape Town TV. Join us to campaign for many of the new channels to be community-operated, as well as the kinds of educational and parliamentary ones currently only enjoyed by satellite viewers. Who will fund all this television? Commercial stations will compete for existing advertising funds. There will be less advertising to go around so you can expect to see a lot of re-runs, old shows, and low budget American productions. Media is a public good essential for democracy so Government should provide public funding for public broadcasters - community stations and the SABC. But the noeliberal policies of our Government have left the public broadcasters to complete with commercial stations for advertising to survive. In this context it is virtually impossible for them to provide the public service broadcasting they are mandated to offer. Join us to campaign for public funding for public broadcasting. The most marginal will be excluded from TV completely! The new digital TV system will require different aerials and for viewers to have a set-top box (like a decoder). These will cost around R1,000 but after protests by R2K and others, the government has agreed to give them for free to 5 million poor households. However we are not satisfied and demands that they be free to all who need them. There will be a certain number of months when both the existing and the digital broadcasts will be working, after which only digital will be available. Viewers who have not managed to install the new aerials and set-top boxes, will then be unable to watch TV. Join us to campaign to ensure nobody has their TV access cut off!